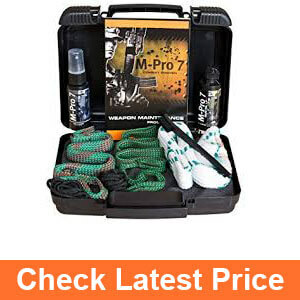 Proper Gun Care with the Best Gun Cleaning Kit in 2019! Best Rifle Bags in 2019 – List From A Gun Enthusiast! After you buy a gun, you have to buy a cleaning kit. It’s just as important a purchase as your gun. Just as the best gun for you will suit your circumstances, the best gun cleaning kit will match your gun and how you plan to clean it. Every gun owner knows that part of responsible gun ownership is cleaning the gun regularly, particularly after each use. Every time you fire your weapon, you get residue and debris inside the barrel and the chamber. If you don’t clean your gun, your shooting accuracy may suffer, the barrel may become damaged, and bullet may even jam when you’re in a life-or-death situation. Of course, if you’re really rich you can just get the gun to a gunsmith for cleaning. But that costs way too much; one cleaning session may cost the same as a good cleaning kit. Cleaning your own gun is a good habit to get into, and besides it can create bonding moments between gun fans within the family. 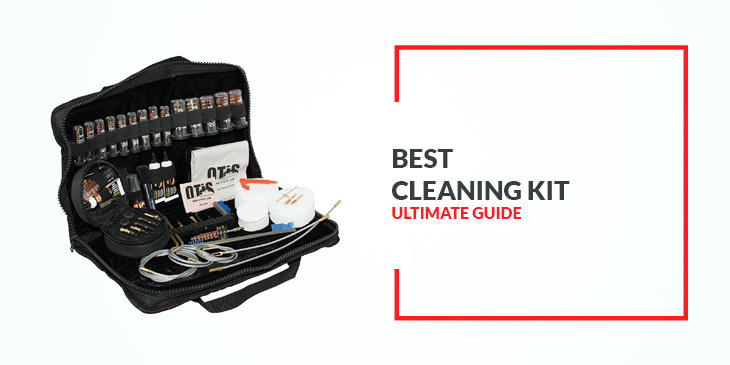 The first step to cleaning a gun is buying the best cleaning kit for your needs. But how do you know which one is the best for you? Obviously the kit will include all the cleaning materials you need so you don’t have to make extra purchases. But these materials should also be of good quality. They should perform their functions well and last long. You may want a kit that’s designed specifically for the make and model of your gun. On the other hand, there are universal gun cleaning kits that can clean all types of guns, which is great for gun collectors. Some kits are strictly for at-home use, while others can be used even on hunting or camping trips. To help you with your choice, here are 10 excellent cleaning kits that can be considered among the best. Though it’s a lot more expensive than the Tactical, it’s also much better with more components in the kit. It’s why so many experts and gun owner say that it’s their favorite cleaning kit despite the cost. Instead of tediously listing all the various components of the Elite, let’s point out the main difference with the tactical. While the Tactical had brushes for 6 specific types of firearms, this Elite kit includes 23 different bronze bore brushes. It actually contains more than 40 firearm-specific cleaning components. 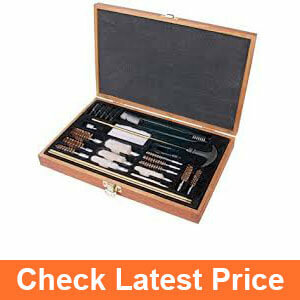 It also contains a brass scraper tool set plus cleaning gear for optics such as rangefinders and scopes. It also has precision tools that will clean crucial areas that you’ve previously found hard to reach before. This comes in a bag that’s larger (obviously), but it’s a nice convenient nylon bag nonetheless. It’s not too big at all. Everything’s laid out neatly, and it even contains a gun maintenance guide so newbies can get started right away. This will clean a lot more guns on your collection—in fact it’s very likely it will clean all of them. It can even clean scopes and rangefinders. The tools are all very effective in what they’re supposed to do. They’re easy to use and they’ll last long too. It’s made in the US. 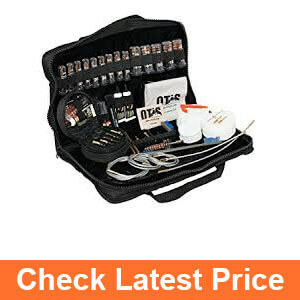 The bag is actually nice, as it’s portable, sturdy, compact, neatly organized, and even has enough space for a few additions you may buy for the kit. For home use, you may want to transfer the contents of the bag into a sturdier tackle box container that you can customize. Do you have a pistol, an AR rifle, and a 12-gauge shotgun? That’s a very common combo for a starter gun collector. It’s also the combo used in the growing 3-Gun competition. If you do have all 3, then you can use this “3 Gun” cleaning kit. You have every tool you need to clean your weapons. Then you’re ready to face the Zombie Apocalypse. What’s great about this kit is that you can just buy it and you can start cleaning. Aside from the various gun-specific tools, you also have a lint-free cleaning cloth, 2-ounce canisters of cleaner and oil, a nylon utility brush, a foam gun pad, and even a weapon maintenance guide for complete newbies. Finally, everything is contained in a plastic hardcase. It’s definitely weatherproof. You can even lock it, because other 3-Gun competitors may get envious. 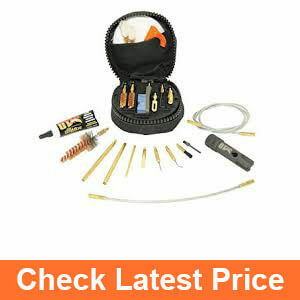 You have the tools you need to clean your pistol, rifle, and shotgun. They’re of good quality too. You also have lots of other accessories. The carrying case is tough and lockable. There aren’t any compartments in the case. All you need extra is a towel or mat for the work surface. Sixty-eight pieces is a lot for a cleaning kit. It contains bronze brushes and mops for 14 different calibers. You also won’t guess as to which caliber the brush and mop is for, as it will have the caliber indicated. In fact, the caliber is stamped on the metal shaft tip, so you don’t have to worry about a sticker coming off. Then there’s a 13-piece solid brass jag set, which will precisely match with calibers from .17 to .50, brass rods for handguns and rifles, different types of utility brushes (stainless steel, nylon, bronze), and 3 different sizes of cleaning patches (50 each). All these contained in a nylon carrying case, and there’s extra room inside for cleaning liquid agents, a bore flashlight, and a small towel for your work surface. Buy those missing pieces, and you’re all set to go even when on the road. 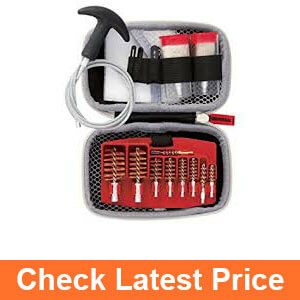 It contains every cleaning tool you need for various calibers. Unless you’re a truly avid gun collector, your gun collection should be among the 14 different calibers that this kit is made for. These consumer-grade tools are of high quality. They won’t just break down right away. They’re US-made. The tools are also stamped with the caliber they’re supposed to be for. The cleaning kit case is very portable. Now you just need the bore flashlight, the cleaning agents, and the towel for the work surface. This is intentionally a kit with few pieces, since it’s intended as a portable cleaning kit. So let’s start with the 5 bore brushes. They’re meant for the 0.22 to 0.223 caliber; 0.30, 0.30 to 06, 0.300 Mag; 0.9-millimeter, 0.357, 0.40 caliber; 0.45 caliber, 0.410 shotgun; 12 gauge shotgun. If your firearms are covered, then this may be for you. This also comes with a lint-free gun cloth, a multi-section cleaning rod with folding handle, 50 square cleaning patches (2.5-inch), an M-16-style utility brush, a shotgun brush adapter, a 0.22 caliber loop, and a foam gun pad. It also has cleaning agents too. There’s a 4-ounce bottle of gun cleaner and a 2-ounce bottle of gun oil. These are for home use, as you also get 4 gun cleaner field packs and 4 gun oil field packs. All these are placed in a hard plastic case. This case won’t bend or tear or let in water. You can even lock it too. The 5 brushes can be used for assorted calibers. It also contains numerous accessories. It includes cleaning agents, with provisions for travel. The hard plastic case is tough and secure. It’s good for some quick cleaning in the field. Since it’s meant for travel, there are only 5 brushes. Newbies would appreciate a manual on how to use some of these pieces. If you’re too rough, you can break some of the tools like a bore brush. There aren’t any partitions in the case. Some people eschew nylon bags or even hard cases for their gun cleaning kits, especially when they only clean their guns at home. A lot of the time they modify a tackle box for their kit instead. Now you don’t have to, since this already comes with its own tool box. It measures 15 by 10 by 8.75 inches, so you can’t exactly put this on your belt. But it’s made for home use. The tools are all compartmentalized, and you have lots of extra space left for your lubricants and even gunsmithing tools. This comes with 65 pieces, and that list includes the usual. You have bronze bore brushes for shotguns, rifles, and pistols. There are brass jags, cleaning rods and brushes, brass slotted tips and adapters, and muzzle guards. You also have cotton patches and swabs along with 4mm and 6mm nylon pick. 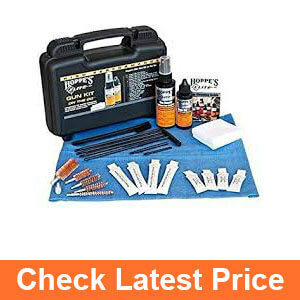 Basically these supplies will do you good if you have the usual calibers for pistols and rifles. This also works for 12-gauge, 20-gauge, and .410 bore shotguns. It pretty much covers the usual guns that avid collectors can collect. There aren’t any standard calibers overlooked. If it seems to miss a piece for a common caliber, then you need to call customer support. Of course, you should double-check, because some brushes and jags are actually meant for not just one specific caliber. You can clean your 9mm with the .357 brush and jag. Use the .22 tools for the .556/.223. That should work. So if you’re a gun collector who likes only common calibers for their firearms, you don’t need several cleaning kits. This one will cover all the weapons you have. This will work for just about every common caliber of firearm out there. There are no exceptions. The tools are of very high quality. The plastic box for the kit is great for home use. 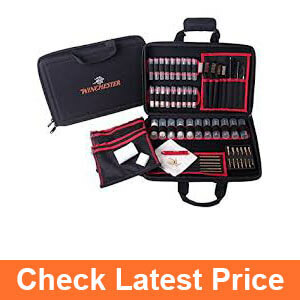 It’s tough, and it allows for easy access to your tools, and each tool has its own compartment. You still need to buy cleaning liquid agents. You may as well buy a work mat plus a bore flashlight. Then your toolkit will truly be complete. What if you’re just a rifle or AR15 owner? Otis also has the Modern kit for you. Once you specify the kind of rifle you have (5.56mm/.223 caliber, or 7.62mm/.308 caliber), you can get the kit you need. This includes the memory flex cables, brushes to remove the copper deposits, the special B.O.N.E bolt carrier assembly cleaner, other special precision tools that lets you break down and fine clean the important areas that you may find hard to reach with other tools. You can even use these tools for some handguns like the .45, though you may have to buy larger patches. You buy this for the tools, but you also get a freebie tube of Otis cleaner plus some patches. They’re all good for a cleaning session or two, but generally you’re supposed to buy your own. This just shows you what the Otis-brand cleaner and patches can do, so you’d buy them again. All these things come in a lightweight soft bag that’s so small that you may doubt that it deserves its price tag. But this bag is well organized, and it even has a belt loop for easier transport on your tactical belt when you are doing outdoor activities like cycling. This gives you everything you need to give your rifle the white glove cleaning it needs. It contains the special BONE cleaner that you’ll find hard to find anywhere else. The price is actually low, compared to what it will cost you should you buy the various components piecemeal. The tools are excellent and will last for a long while. The bag is nicely arranged. The kit is very portable. You may want to supplement this with a .223 bore mop. If you have a .45, you’ll also need a barrel mop and a brass brush for it. This is the Otis Tactical cleaning system that’s been around for years, and it’s justifiably famous around the world. Otis has other kits, but this Tactical version is the foundation for their more advanced kits (such as the Elite). This can “patch” clean just about every caliber weapon you may have. This includes patches for small caliber weapons as well as cotton cleaning patches for larger caliber weapons. As stated it has 6 bronze bore brushes for .22, .270, .30, .38, .45 cal. rifles/pistols and 12/10-gauge shotguns. Aside from that, you have 3 cleaning rods with a tensile strength of 750 pounds, 3 forged slotted brass tips, a tube of Otis Ultra Bore cleaner, lubricant, and preservative, a shotgun brush adapter and rubber patch savers for complete cleaning of your shotgun barrels. You get all this for a very low price. It may also surprise you to learn that these components are stored in a soft case that measures just 4 by 2.5 inches. This case even comes with a belt loop so you can carry it with a thick tactical belt. If you have the guns for which the brushes were made for (.22, .270, .30, .38, .45 cal. rifles/pistols and 12/10-gauge shotguns), then you’ve got an ideal cleaning kit here. The bag is laid out nicely so you can have your tools found easily. The bag and kit is very compact, which saves you a lot of trouble with portability and storage. If you’re going out on the field, you can bring this with you with no real trouble. The cleaning materials are of high quality, so they won’t break after a few uses. This kit really makes it easy for you to clean all your firearms. It cleans your weapons without damaging them. With its price, it offers superb cost-effectiveness. You’ll have to supplement the kit if none of the brushes work for all your firearms. The Real Avid kit meticulously lists down the calibers that their accessories can fit. These are the calibers .17, .22, .223/5.56mm, .270/.280/7mm, .30, .357/.38/9mm and .45, along with the 12 and 20-gauge shotguns. So if you own a .40 Smith and Wesson, this is not for you. However, this kit can accommodate people whose numerous firearms are all among the listed calibers. This includes the cleaning cables with the T-handle, along with bronze brushes and mops and various other accessories and adapters. It also includes 25 cleaning patches. Everything is in a zippered cleaning kit that’s weatherproof and compact. The kit is very compact. Yet it still has some room if you want to buy brushes for other calibers it doesn’t contain. Everything is of good quality. Even the zipper on the case is heavy duty. 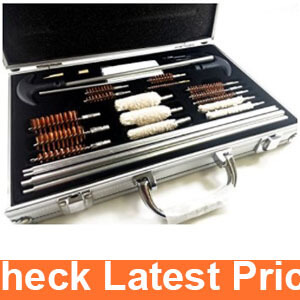 For the most part it contains brushes for the common rifle and handgun calibers. It doesn’t have tools for the .40, though that’s a gun that many have in their collection. You’ll have to buy your own solvent. Let’s see what we have here. First we have an elegant looking wooden case made of aged oak measuring about 7.5 by 12 inches. We open it and you get to see all 28 pieces in their proper compartments. These include 3 solid brass rods, 8 bronze brushes, 5 mops, 5 spear pointed jags, 2 slotted patch loops, a double ended nylon brush and cleaning pick, 50 cleaning patches, and a shotgun adaptor. Count the cleaning patches as one and consider the case too, and it really does add to 28 pieces. Now all you need is to get the cleaners, oils, and protectants (all of which Outers sells), and you’re good to go. Unless you’re extremely picky (and you shouldn’t be considering the affordability of this set), this should serve you well. In fact, it seems expensive when you look at it. Of course these are all consumer-grade and not professional-grade, but they work just fine. It contains bronze brushes for the 8 most common calibers. It also contains universal components that can clean many types of firearms. Aside from the cleaning agents, it’s a fairly comprehensive set. The quality is good enough to get the job done. It’s great on the road. The case is wooden, which isn’t so common among many of these affordable kits. The tools get the job done, but they’re of average quality when it comes to durability. You still need to get the cleaning agents plus perhaps a few more cleaning accessories. If you’re in need of a starter kit for numerous forearms, this can suffice. It’s affordable yet it has a 28-piece set that can help with common calibers from a .17 caliber to a 12-gauge shotgun. Unless you have some sort of exotic gun, this should do nicely. This comes with just about everything you need when it comes to cleaning tools. They’re all very easy to use and work effectively. You just need to be gentle when you clean your forearms with these things. It’s a starter kit, so durability can be an issue. It also doesn’t have the cleaners and cleaning agents, but then again those are cheap and you may have your own preference. What it does have is a carrying case, and what’s more it’s not a soft nylon bag. 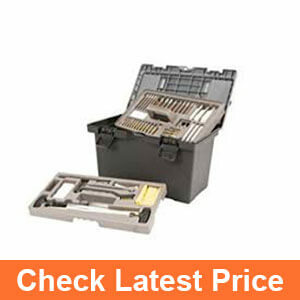 It’s actually an aluminum case that helps protect your tools and the case can keep them set in their slots. 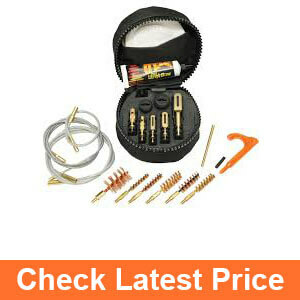 It contains all the tools you need for a starter gun cleaning kit. It can clean various handguns, rifles, and shotguns. The tools work very well. The aluminum case is light and sturdy. For its price you sure do get your money’s worth. You still need to buy cleaning agents. If you’re too rough, the tools won’t last and they’ll break and bend. Pick the best gun cleaning kit here, or just pick one. The point is that you have to clean your firearms. A cleaning kit is much more economical, because the cost of having a gun smith clean your firearms is the same as some of these kits. It just makes more sense. Best Tactical Belts - Top Models Compared! Best Shoulder Holster - Top Models Compared! Best Ankle Holster - Top Models Compared! ​Best Rifle Bags - Top Models Compared! Best Rifle Laser - Top Models Compared! Best Rifle Slings - Top Models Compared!